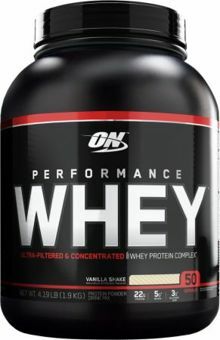 Protein Blend (Whey Protein Concentrate, Whey Protein Isolate, Hydrolyzed Whey Protein Isolate, Hydrolyzed Whey Protein Concentrate), Creamer (Glucose Syrup Solids, Coconut Oil, Sodium Caseinate, Di-Potassium Phosphate, Silicon Dioxide, Titanium Dioxide, Mono- And Diglycerides, Turmeric And Annatto Extracts, Artificial Flavors), Medium Chain Triglycerides, Natural And Artificial Flavors, Lecithin, Acesulfame Potassium, Sucralose. Performance Whey is an all-whey protein formulated for active adults who demand more from their AM, pre-workout and post-workout shakes. Along with ON's legendary quality, it delivers incredible versatility and superior value. Each scoop mixes up effortlessly in as little as 3 to 4 ounces of water, milk or your favorite beverage. You can also go with 6 to 8 ounces. As a shot or shake, Performance Whey provides amazing milkshake-tasting muscle building support from 22 grams of protein. Ultra-Concentrated WHEY PROTEIN Shot – Mix one rounded scoop of Performance Whey with 3-4 ounces of cold water or milk for 15-20 seconds. Whey Protein Shake – Add one rounded scoop of Performance Whey to a glass or shaker cup filled with 6-8 ounces of cold water, milk, or juice. Mix for 20-30 seconds.